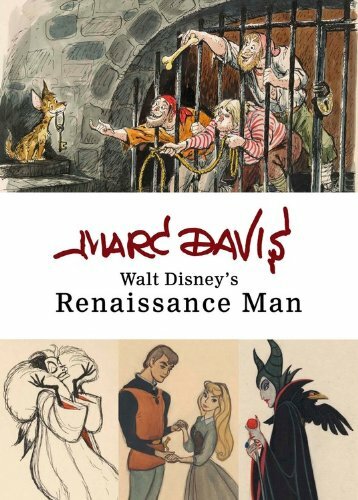 Walt Disney once said of Marc Davis, "Marc can do story, he can do character, he can animate, he can design shows for me. All I have to do is tell him what I want and it's there! He's my Renaissance man." As such, Davis touched nearly every aspect of The Walt Disney Company during his tenure. He began as an animator, whose supporting work on Snow White and the Seven Dwarfs and Bambi inspired Walt to promote him to full animator. In the ensuing years, Davis breathed life into a bevy of iconic Disney characters, including Cinderella, Alice (in Wonderland), Tinker Bell, Maleficent, and Cruella De Vil. Then, in 1962, Walt Disney transferred the versatile Davis to the Imagineering department to help plan and design attractions for Disneyland and the 1964 65 New York World's Fair. While at Imagineering, Davis conceived of designs for such classic attractions as Jungle Cruise, Pirates of the Caribbean, and Haunted Mansion. As Davis had so many talents and hats, it is only fitting that this tribute be composed by a multitude of talented writers. Experts in fine art, animation, Imagineering, and filmmaking have come together to honor Davis's contributions to their realms. Each chapter is accompanied by a wealth of artwork, much of which was offered up by Alice Davis exclusively for this book. This volume is both the biography and the portfolio of a man who was, on any given day, animator, Imagineer, world traveler, philanthropist, husband, and teacher.